Egyptian mythology isn't such a rare topic as many might think. So if someone's not fascinated enough by the genuineness of Nile, there are plenty of others to find too with the same concept. Like Coffin Texts for instance. 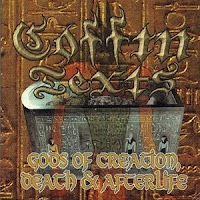 With a stunning high quality debut they appeared, and unlike other bands with the same concept, Coffin Texts showed some endeavor to transmit the feeling of the death cult of Egypt by the music too, not only by the lyrics. That's definitely a genuine feature, and as Apophis was first in the concept, Coffin Texts was the first in it's musical transmitting. With a characteristic, atmospheric rotting sound and distorted vocals they experimented to recall the realm of the ancient, thousand years forgotten gods, and inviting the listener for a walk into the vacant, mysterios tombs of their long decayed followers. Anyway that doesn't sound like a big deal to manage if it's about death metal, so it's a wonder why the others didn't try that before. Immolation and Morbid Angel could be named in first line as their musical influences. "Gods of Creation, Death & Afterlife" is like the remastered version of their same titled demo, and with some song covers was it extented to album-lenght.